The first track from JACO: Original Soundtrack is out. The track was exclusively debuted on Billboard.com. 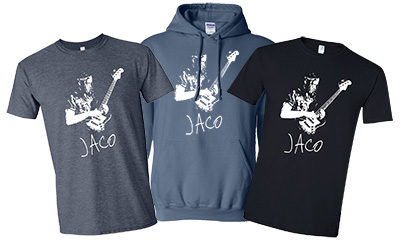 Among the 16 tracks are five new interpretations of Jaco’s songs. This first one is Mass Mental’s take on “Come On Come Over”, which first appeared on Jaco’s 1976 solo debut. Film producer and Metallica bassist Robert Trujillo reformed Mass Mental for the soundtrack. “JACO” and the companion soundtrack will be released on November 27th. This is a fine interpretation… and to all those “haters” who were expecting something different, get in your time machines, go back to 1976, and stay there. Jaco was an original. After him, everything else was different or a copy. Thelonius Monk was thought to be crazy, too. Now he’s considered a genius! Change is good! Just ask Bob Dylan. I don’t like it, sorry. Slap-Bass as a tribute to Jaco? Come on… Thats blasphemous. Today i see the film in my town, Barcelona. Its a big film! I am very happy, i am a Bassplayer! Ok.ok!! Big version Come on, Come on Over!! I now have more “funk face” wrinkles after listening…awesome stuff, cant wait for the release! badass bob, really kicks fonky. thanks for doin the jaco film , i can hardly wait. Great Job! Funky Interpretation . And many thanks for your engagement concerning Jaco! I love this version too…sounds more funky…nice voice!